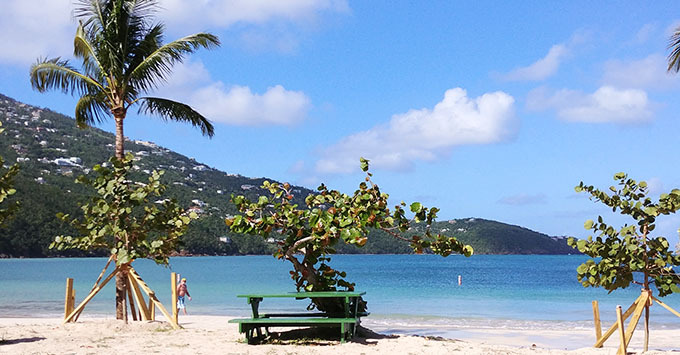 (3:40 p.m. EST) -- Against a backdrop of sparkling blue water, white sand and mostly sunny skies, the U.S. Virgin Islands and Royal Caribbean held the official reopening ceremony of St. Thomas' Magens Bay. The beach, one of the most popular among locals and cruise visitors alike, had been completely destroyed during September's Hurricane Irma. "You couldn't have found Magens Bay if you didn't know where to look," Richard Fain, chairman of Royal Caribbean Cruises Ltd. told an assembled group of local dignitaries and press about his first visit to St. Thomas after the hurricane. St. Thomas welcomed its first cruise ship since the hurricane, Adventure of the Seas, on November 10; at that point, the beach was open but still undergoing cleanup. Since then, Fain said, the ratings for the beach from Royal Caribbean cruisers have actually gone up from pre-Hurricane visits. 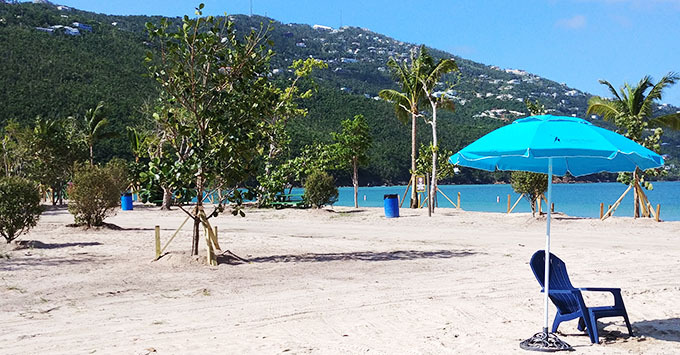 Royal Caribbean worked closely with the government of the U.S. Virgin Islands on the three-month redevelopment of the beach, which required 100 dump trucks to remove debris, 110 workers on site, 30 shipping containers of material, and 530 newly planted trees (most brought in from outside the Virgin Islands), among other efforts. "It's hard to comprehend the massive devastation that occurred throughout the island," Fain told Cruise Critic. "And particularly this bay. It's so iconic, to the people here and also to our guests. "We wanted to help but the needs were so overwhelming. We knew that what we could do was very little but we wanted to find something that would make a difference and be something that mattered. This was perfect. It is such an important place and someplace that people here feel very emotional about." Fain and Michael Bayley, president and CEO of Royal Caribbean International, were among the Royal Caribbean employees who joined with U.S. Virgin Islands Governor Kenneth Mapp and other government officials gathered to rededicate the beach. "Hurricanes are about devastation," Governor Mapp said. "But when you turn the quarter over, hurricanes are also about opportunity." Among the repairs undertaken were a replacement (and standardization) of all signage, rebuilding of all picnic benches using the same materials from before the hurricane, newly built lifeguard stations and the planting of more than 530 new trees, palms and shrubs. A further 470 trees were nursed back to life by an arborist brought in from Florida. Additionally, Royal Caribbean sponsored and designed an as-yet-unnamed art installation for the beach. Created from 300 reclaimed wooden planks and doors that were collected in the aftermath of the storm, the three weather-beaten but colorful walls tell the story of the island, from devastation to renewal. Ninety-two days after Hurricane Irma -- and 47 years and one month since Royal Caribbean visited St. Thomas for the first time on its very first sailing ever -- Governor Mapp declared "We are ready to receive tourists."